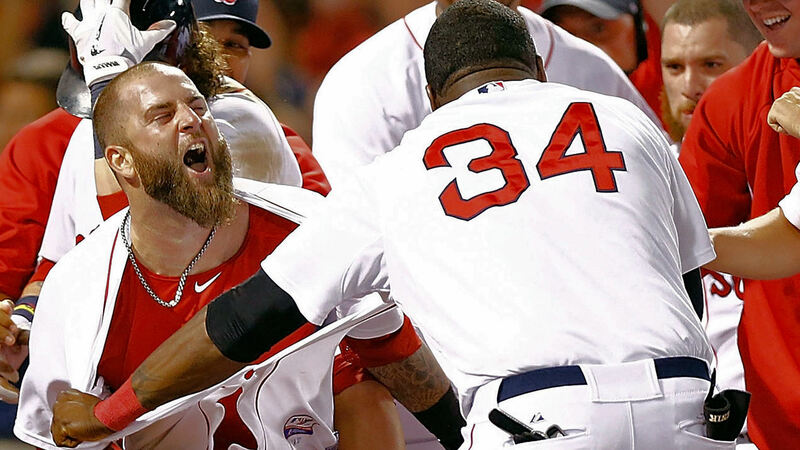 ON THIS DATE (July 21, 2013) ... Mike Napoli came to the plate in the eighth inning on with a chance to be the hero. The Red Sox had the bases loaded with one out in a tie game with the Yankees. Napoli grounded into a double play and extra innings followed. When Napoli came to the plate again, this time on Monday morning, he didn't miss his second opportunity. Napoli belted a home run to straightaway center field in the 11th inning to end a wild night at Fenway Park as the Red Sox beat the Yankees, 8-7. He was mobbed by his teammates at home plate after ending the thrilling victory over the Yankees. At that joyous moment for the Red Sox, it hardly mattered at all that Napoli had struck out three times. All that was relevant was the sheer force Napoli put into that solo rocket of a walk-off homer against Yankees reliever Adam Warren that landed in the bleachers in straightaway center. By the time Napoli reached home, the strong-armed David Ortiz had ripped the first baseman's jersey open. Earlier in the night, Napoli hit a towering blast that soared over the Green Monster and onto the street to turn a 3-1 Yankees lead into a 4-3 edge for Boston. On this evening, Napoli produced more power than he did between June 2 and July 5, when he went deep just once. Through their first 100 games, the Red Sox have 60 wins, nine of which have come via a walk-off hit. Ultimately, a hard-fought battle came down to a huge swing by Napoli. The Sox are 6-3 against the Yankees this season.